Standing Hungarian Warmblood, Percheron, National Show Horse, and Arabian stallions at stud. Includes sales list, photos, and profiles of horses. Offers photography services, training, and lessons. Located in Graham, Washington. Offers imports, training, and sales of European Warmbloods and Irish Sport horses. Details of horses and ponies available. Laguna Niguel, California. Standing bay, gray, and chestnut stallions at stud. Includes sales list, photos, and profiles of horses. Located in Downsville, Wisconsin. Warmbloods, hunter/jumpers, and show horses for sale. Includes sales list with photos and profiles of horses. Offers Pembroke Welsh Corgi at stud. Located in Buckhead, Georgia. Includes sales list, photos, and profiles of horses. Located in Queensland. Includes sales list, photos, and profiles of horses. Located in Maitland, New South Wales. Specializing in Friesian Crosses, Baroque Horses, and Warmbloods. Located in Deerwood, Minnesota. Standing bay stallion at stud. Includes sales list, photos, and profiles of horses. Located in Branxton, New South Wales. Imported Hunters, Jumpers, Dressage horses, and ponies for sale Specializing in Holsteiners, Warmbloods and Hanoverians. Lists stock available. Santa Barbara, California. Standing chestnut stallion at stud. Includes sales list, photos, and profiles of horses. Located in Langley, British Columbia. Specializes on Trakehner and Hanoverian lines. Offers mare, foal and gelding information, sales horses, and video clips. Located in Zehner, Saskatchewan. Standing Decoupage, 1999 Oldenburg stallion. Breeding horses for dressage and jumping. Stallion information, photographs, and sales. Purcellville, Virginia. Breeders of Dutch warmbloods and Oldenburgs to be used as sporthorses. Includes farm profile, photos, and horses for sale, including young stock. Located in Riegelsville, Pennsylvania. Kansas City stallion station and breeder of American Warmbloods. Standing Belgian Draft and Paint stallions. Horses for sale. Offering Warmbloods and Miniature Horses with type, movement and temperament. Photos and pedigrees of foals, stallions and broodmares, youngstock for sale. Located in Boolarra, Victoria, Australia. A full-service dressage training and boarding facility, located near New York City, owned by Kate Theallet. Imports, trains, and shows European Warmbloods. Details of facilities and horses for sale. Breeders of Quality Dutch Warmbloods in Massachusetts. Horse breeder offering broodmare and reference sire information, plus a sales list. Boarding and breeding farm offering Dutch and Holsteiner stock for sale. Located in Donalda, Alberta. Small breeder producing 1-2 foals a year. Mare and reference sire profiles, and a sales list. Provides discussion forums for individual breeds, disciplines and care issues, a sales list, and links. If the business hours of Shirefox Farm in may vary on holidays like Valentine’s Day, Washington’s Birthday, St. Patrick’s Day, Easter, Easter eve and Mother’s day. We display standard opening hours and price ranges in our profile site. We recommend to check out shirefoxfarm.com for further information. 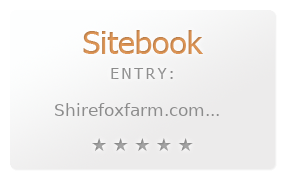 You can also search for Alternatives for shirefoxfarm.com on our Review Site Sitebook.org All trademarks are the property of their respective owners. If we should delete this entry, please send us a short E-Mail.